"Crouching Dragon" is a dangerous stream. 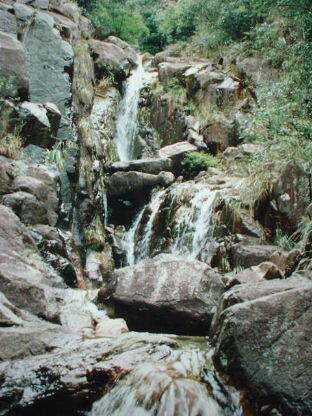 It is one of the Five Dragon Streams in the Tung Chung region of Lantau Island. The other Dragon Streams are Yellow Dragon, Hidden Dragon, East Dragon and North Dragon. Crouching Dragon Stream should be the most challenging one of them. It has been a mysterious natural place. With the development of Tung Chung and its MTR station, this place is more easily accessible nowadays. 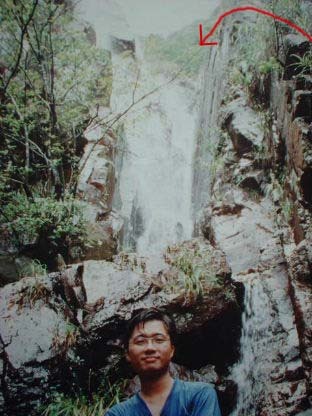 We have visited the Tung Chung Dragon Streams region for many times. 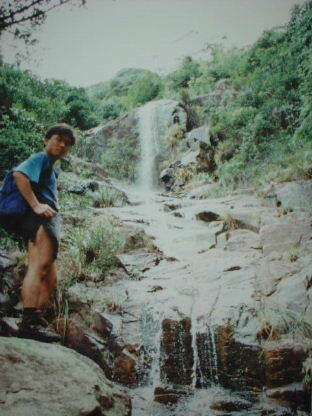 It is really an attractive wild place for adventurers who love stream trekking. 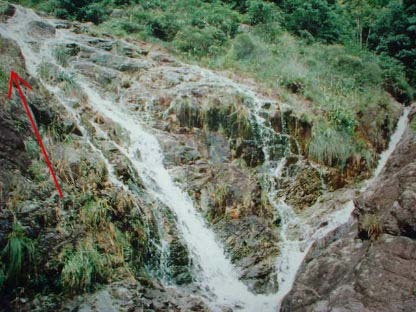 Nevertheless, you are strongly advised NOT TO GO into this Crouching Dragon Stream unless you were an experienced stream-climber and you were well-prepared with climbing equipment e.g. ropes and harnesses. Please DON'T bring any inexperienced person into the stream. It would be a great trouble to them. If there was any accident happening, it could be a very serious one. We began our journey by walking along the Wong Lung Hang Road and then entered into the main stream of that region, i.e. the Yellow Dragon Stream (synonym: Wong Lung Hang). 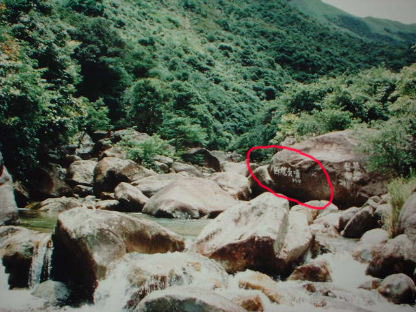 After a 20 minutes' stream walk, we met a big rock with the words "Crouching Dragon Stream" painted on it (Circle in red on the photo). This rock hallmarks the start of the exciting journey. As you could see from the map, Crouching Dragon stream is a actually a side-branch of the Yellow Dragon Stream. 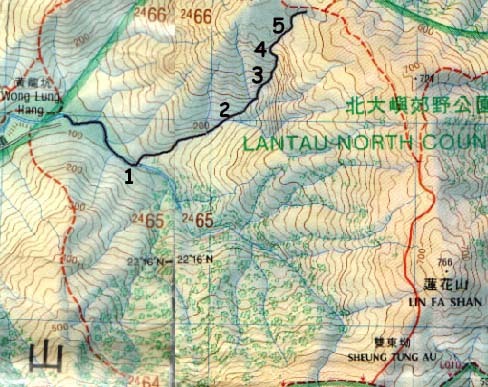 The altitude of this entry point is around 100m. The Stream runs in a north-east direction. At this point, we met the Dragon Claw Falls and Pool. It has been named so because the falls looks like a claw. We climbed up the left-handed side of the Falls and continued the stream trekking. (Be careful that there are two branches upwards above this point. The correct way is the left-sided branch). The stream became steeper as we trekked upwards. We met a variety of falls. One of them was made up of three consecutive falls. There were big rocks in between. 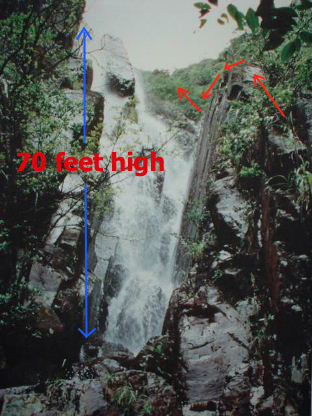 Another moderate-sized falls waiting us to climb. The most difficult and dangerous part of the Crouching Dragon Stream is at the end. As we came closer, we heard the roaring sound of the Falls in the "Ultimate Dragon Valley". Our adrenaline level was building up; the heart rate was increasing. It was astonishing to see that great Falls of at least 70-feet high. The Ultimate Dragon Valley is made up of the Falls and two vertical cliffs on both sides. We took a rest there. All of a sudden, we felt there was rain falling onto our shoulders. The rain was not very heavy, but it imposed a big trouble to us. It made the climbing much more difficult and dangerous. We looked at the cliffs on both side, thinking about the possible climbing route. The left-hand sided cliff was too vertical to climb; it was impossible to go by that way. We chose the right-hand sided route as shown on the photo (The arrows/ line in red). To climb on that cliff is difficult and dangerous for many inexperienced people. As you could see on the photo, the rocky surface is steep. On that day, we had to climb upwards on a slippery rock face. Then we moved along a very narrow path along the edge of the high cliff. It was so slippery that I didn't dare to go in any big step. There was not much grass for us to grasp on. Looking towards my left foot, I could clearly recognize the deep bottom of the Falls. No step was 100% safe. Besides my own effort, God's blessing is very important. Don't expect the climbing is finished so soon. After the above movement, we were hanged on another point while we needed to balance our bodies on a small slippery step of the cliff. I had no choice in movement. Climbing upwards was the only option because it was more dangerous to move backwards. As we were climbing upwards, the cliff appeared nearly vertical. Everybody became calm. Luckily, an experienced rock climber of our teams broke the silence. He got the greatest courage to climb up furthermore (Of course, there was no protection for him. We could not set any anchor to do belaying for him). By climbing on the steep and slippery cliff with only loose soil on the surface, he got above us for about 10 feet high and set an anchor to belay us. Thanks to him very much. Steps by steps, we moved into a hidden path in the grassy area. Ultimately, we escaped from the danger! WARNING AGAIN: If you were climbing up the cliff without any safety equipment, make sure you don't fall. You cannot afford this event, simply because this could really make your life "ultimate" !! !